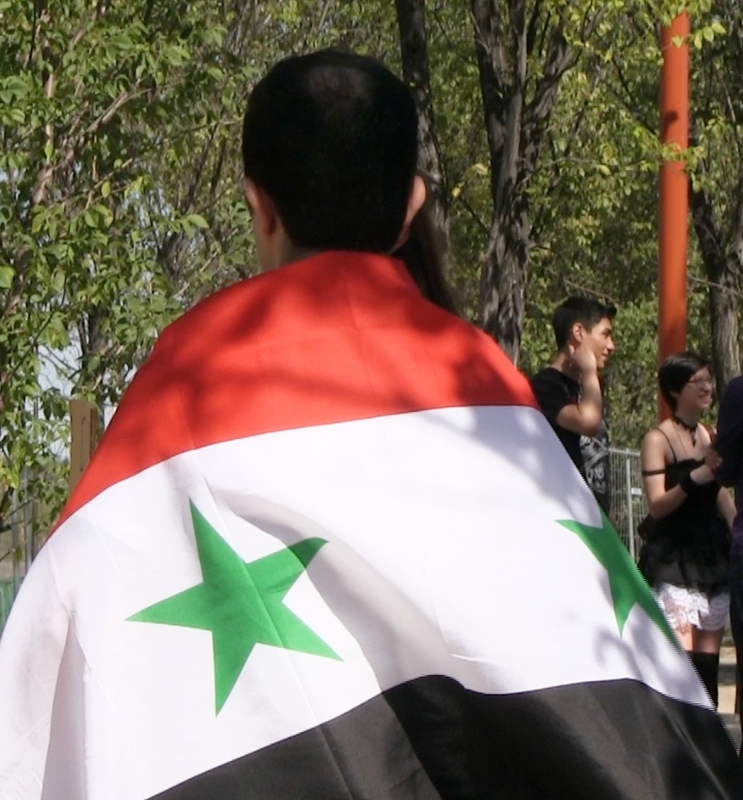 Sept. 7, 2013: For the second time in a week, Winnipeggers rallied in solidarity with the people of Syria and in opposition to a US led attack. After a brief gathering on the steps of the Manitoba Legislature, the demonstrators took to the streets to hand out literature and talk with their fellow Winnipeggers. Complete texts of the speeches delivered by Carr and Michalchuk are available here and here, respectively. For more, watch my video report. As the United States moves closer to a direct military strike on Syria, the world draws closer to a conflict that could spread well beyond the boundaries of that war-torn nation. The pretext for an American strike is an allegation, as yet unproven, that Syrian government forces used sarin gas on opposition forces and civilians. A UN weapons inspection team is on site to determine if chemical weapons were used, though it has no mandate to determine who might have used them. Regardless of what the UN might say, the American government has decided to press on with “punishing” the Syrian regime. No such action is mandated by the 1925 Geneva Protocol on chemical weapons, and an attack would violate international law. Despite the US government’s assertions of overwhelming proof, only France has said it will join the US in an attack. The British Parliament, last week, voted against military intervention. The UN Security Council has refused to authorize a strike. NATO has ruled out military action. British MPs voted against military action because the British people were well aware of the falsified British and American intelligence reports that were used to justify attacking Iraq in 2003. That invasion caused the deaths of hundreds of thousands of Iraqis and almost 5,000 coalition troops. Four million Iraqis became refugees, the country’s infrastructure was destroyed and Iraqi society was fragmented by sectarian violence that continues to this day. Canada has funneled more than $5 million to opposition forces and endorsed the use of military force. PM Harper has ambiguously stated that, “at the present time the Government of Canada has no plans, we have no plans of our own, to have a Canadian military mission.” Although Canada has said that it doesn’t intend to send troops, it has provided the US government with consistent political support. We must pressure the Canadian government to reverse that support and we must express our opposition to the US war drive. The people of Syria have already suffered over two years of a devastating war, with more than a hundred thousand Syrians killed and millions driven from their homes. What began as a nonviolent protest and then civil war has expanded to sectarian and even more dangerous international conflict. Syria is a battleground where conflicts are being fought out between regional powers (Saudi Arabia and Iran) and global powers (the US and Russia). A US military attack would worsen the conflict between heavily armed and powerful forces, seriously escalating the war and further destabilizing the Middle East. Attacking Syrian forces with cruise missiles and drones, which is what the US military is likely to do, will only add to the death toll and delay the peace negotiations that must ultimately bring this war to a close. Even if, through some miracle, the violence remains contained within Syria, the price will still be paid by the Syrian people. Last weekend there were antiwar demonstrations around the world. Protests were held in more than 12 Canadian cities, including Winnipeg. This attack can be prevented, but only with a huge global response. We need to show our solidarity with the people of Syria and stop the US from launching its missiles under the guise of humanitarian intervention. The lives of tens of thousands more Syrians are at stake. What can we do, here, in Winnipeg? 1. Provide genuine humanitarian aid to the victims of the civil war in the form of food, medical supplies and financial contributions to the reputable humanitarian aid groups that have been stretched to the breaking point by this crisis. 2. End all forms of material and political support to opposition forces. 3. Adopt a genuinely neutral position on the world stage and press for peace talks that involve all of the contending forces. Parliament must be reconvened to reverse the damage that our government has done by taking sides in this civil war. Canada has to become a responsible voice for peace in the Middle East and the world. If you don’t know how to get hold of your MP, here are some phone numbers. For more complete contact information, go here. Get involved. You can find No War With Syria (Winnipeg) on Facebook. Peace Alliance Winnipeg is also on Facebook, and on the Internet. Please contact us. Together, we can do our part to work for peace.